Posted October 21, 2015 by McIvor Farrell & filed under News. McIvor Farrell Solicitors have been made aware of attacks made on other Solicitor Firms’ IT Systems in order to defraud clients out of money from their bank accounts. We can reassure all clients that our IT Systems are completely up-to-date with Firewalls and Ant-Virus Software and that we have not fallen prey to any attempted fraud. However for the sake of clarity, we will never ask you to provide your bank account details to us via email nor will we ever send you an email with our account details asking you to deposit monies into it. If you have any concerns in relation to any email received from us please alert us to your concerns immediately. Posted September 30, 2015 by McIvor Farrell & filed under News. We are very pleased with our targeted marketing campaign in the Greater Belfast area. We have a strong reputation within the community for a wide range of legal services but our current campaign focuses on our strengths in personal injury compensation claims. We are delighted with our current marketing strategy in association with Clear Channel. As a business with over 20yrs experience in compensation claims we can be trusted to ensure the best results in each case. Posted July 18, 2015 by McIvor Farrell & filed under News. 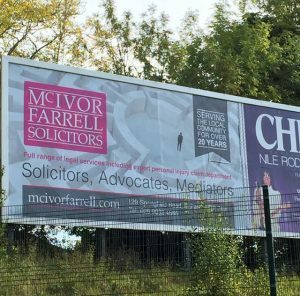 McIvor Farrell Solicitors Limited are proud to support the latest Campaign from the “Will to Give” Charity. “Will to Give” is a consortium of some of Northern Ireland’s most cherished Charities who have come together to promote charitable gifts in Wills. Member Charities cover a broad range of causes and are off ever size and scale. “Will to Give” has grown considerable from its inception in January 2011 and today has 45 active Charity Members whose representatives meet on a monthly basis. The people of Northern Ireland are extremely generous in showing their support for good causes and do so in many ways. It often comes as a surprise therefore that only 3% of the people in Northern Ireland who make a will leave a gift to Charity. “Will to Give” is working to increase the number of gifts made to charity in this way and we at McIvor Farrell are pleased to support their efforts by making all of our clients aware that giving to charity in their will is an option. If you are thinking of making a will, please feel free to contact our Probate Department who will be happy to advise you of your options. Remember our initial consultation is free so call today. Posted June 10, 2015 by McIvor Farrell & filed under News. McIvor Farrell are delighted to have been chosen by International Global Law Experts (GLE) as their Editors choice for the “Regional Criminal Defence Firm” of the year in Northern Ireland. Earlier this month the awards panel convened and the winners were selected. The shortlisted firms were judged on client testimonials, key cases, legal rankings, overall reputation, publication contributions, speaking engagements and the performance and standing of teams and individual lawyers. During the recommendations stage GLE received over 100,000 responses from business directors, in-house legal counsel, independent law firms, high net-worth individuals, bar associations, visitors to the GLE website and LinkedIn users. These recommendations were combined with GLE’s own independent research in order to create a shortlist for each award. Posted May 19, 2015 by McIvor Farrell & filed under News. On 29th April 2015 McIvor Farrell Solicitors Ltd underwent a full reassessment of our LEXCEL accreditation which was first obtained in 2012. The assessment involved an on-site audit by an independent assessor across all a spects of our practice. At the conclusion of the 2 day assessment we were delighted to have succeeded once again in attaining the high standards required for our LEXCEL accreditation. LEXCEL is the Law Society’s legal practice quality mark for excellence in legal practice management and client care. Not all Solicitors achieve accreditation and we are among the few who do in Northern Ireland. LEXEL provides a robust management framework to help legal practices develop consistent operational efficiencies and deliver client services at the highest level. 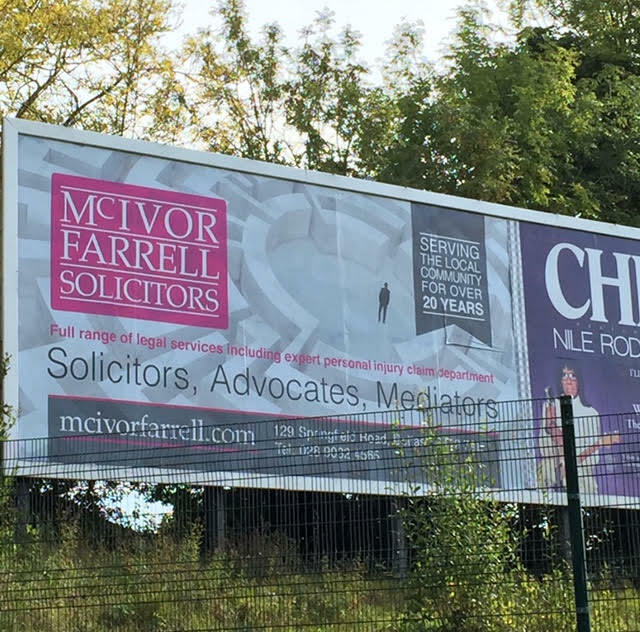 Our LEXCEL Coordinator, Ciaran Maguire, said “At McIvor Farrell we believe it is vital to manage the quality of our legal services effectively. A quality management system that is independently assessed demonstrates our commitment and ability to constantly deliver services that meet and exceed client expectations. We will continue to demonstrate the commitment required to achieve the LEXCEL standard going forward to 2016 and beyond”. Mc Ivor Farrell as part of their ongoing commitment to assisting in the development of the legal profession in Northern Ireland are pleased to announce that the recipient of the McIvor Farrell Prize for the Best Performing Student at the Institute of Professional Legal Studies in the Negotiation Category is Niamh Hargen. Posted May 12, 2015 by McIvor Farrell & filed under News. McIvor Farrell recently defended an Accused of two Robberies where the Probation Board had assessed him as ‘Dangerous’ prior to sentencing meaning that he was likely to receive an Extended Custodial Sentence. We robustly challenged this assessment and Solicitor Advocate, Paul Farrell, made legal submissions to the Court and obtained expert Forensic Psychology Reports disputing the Probation Boards findings. Following a fully disputed hearing the Court accepted the Legal Arguments and Medical Opinion advanced by the Defence and the Offender was not deemed to be Dangerous and received a Determinate Custodial Sentence of two and a half years custody and two and a half years on licence upon release. Posted April 24, 2015 by McIvor Farrell & filed under News. Posted March 13, 2015 by McIvor Farrell & filed under News. We have initiated Judicial Review Proceedings against the Department For Social Development in respect of their decision to remove our client’s Widowed Parents Allowance when her partner recently began to reside at her home. In recent times, a decision was made to allow widowed spouses of Royal Ulster Constabulary Officers to retain their Widows Allowance should they commence a subsequent relationship. We have made the submission to the High Court that there should be no discrimination between ordinary widows and widows of Royal Ulster Constabulary Officers. We are firmly of the view that the current policy of the Department For Social Development is at odds with the conventions of marriage and private life. This is a case that involves far-reaching human rights issues and it is currently before the court. X v Facebook Ireland Ltd. The facts and circumstances of this case concern our client being identified and specially named on a Facebook page entitled ‘INLA Touts’ and the resulting threats on his life. The Courts have previously demonstrated where there exists a breach of a person’s convention rights, that Facebook can be made the subject of injunctions to prevent further harm. The possibility of actions against Facebook has been considered by the Court most recently in XY v. Facebook Ireland Limited  NIQB 96 and CG v. Facebook Ireland Limited & McCloskey  NIQB 11. Stated he would continue to be under surveillance. This case is currently before the court and no further comment can be made at this time.